The votes are in and the exit polls are out. Not that the latter necessarily makes you any the wiser. Yes, Rajasthan continues to trend towards the Congress and KCR seems to be coming back in Telangana. Madhya Pradesh and Chhattisgarh? Your guess seems to be as good as the pollsters who themselves are a divided lot. So you are left with an "anything could happen" and the favourite political phrase, "It depends." The problem is that the more exit polls you have, the more scenarios they throw up, or so it seems. In Telangana, if you believe the local TV channels and their polls, KCR is coming home singing, winning anything from 75-90 seats in the 119-seat assembly. That means TRS, what the opposition calls KCR's personal party, will gain 12+ seats. That would be a huge victory, far bigger than conventional wisdom would have projected. (Of course, there are reports the State Intelligence Bureau has also predicted a sweep for the Chief Minister, but that is hardly surprising: after all, in 1977, the Intelligence Bureau informed Mrs Gandhi she was at the height of her popularity.) 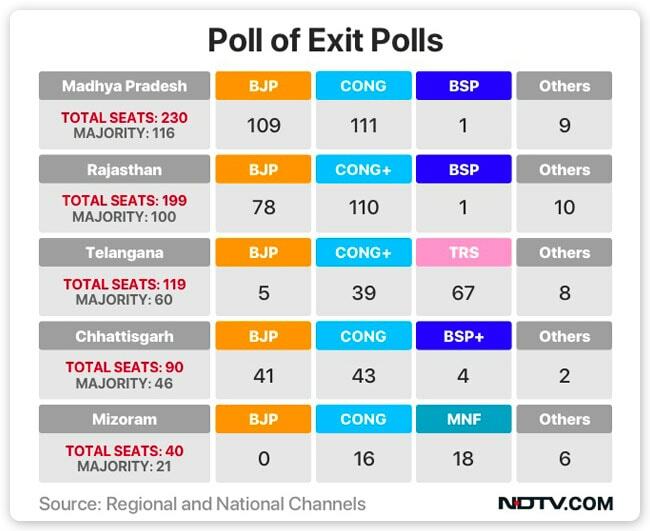 One way people avoid the pitfalls of these vagaries of exit polls is to do a poll of polls (like NDTV) and then give the average of all them as the best possible scenario. This works when there are few outliers, and the range is reasonably narrow. And this is what you get. But the outliers are the spoilers. If you look at Telangana, the trend is clear, but because of two polls, the poll of polls shows that the TRS is coming back with a good working majority, and while that may happen, it's actually against the trend of the exit polls, which show the TRS as the single-largest party close to, but probably short of, an overall majority. If you leave out the two local channels, of the five, only one, Times Now-CNX, gives the TRS an unqualified majority. All the others are below the threshold of a majority (RepublicTV-Jan Ki Baat gives the mid-point of the possible range as 57). This is just short of a majority and is supported by using the median rather the average of the different polls. The big factor in favour of the TRS is that they start with 40 solid seats and need to hold/win another 20. A big problem for the Congress has been that its allies seem to have brought nothing to the table. Even the TDP seems to have lost ground as KCR has trashed it as Naidu's attempts to get into Telangana through the back-door. With the chances receding in those 18 seats, Congress needs to win 60 out of the remaining 101. That's a tall order in a state where 8% of the voters have disappeared from the electoral rolls and the state election commissioner responds to that omission with "Sorry!" And the consequences are huge. It means that for KCR to form a government, he will have to seek support from Asaduddin Owaisi's MIM, which is assured of 7 seats, or the BJP, which is looking at between 5-7 seats. Either of these will raise issues for how seats are shared for the general election as either MIM or BJP (depending on whom KCR allies with) will be more demanding. Of course, KCR could break the TDP again, as he did last time. The median versus average does not make that much difference in states where exit polls have been in a narrower range. In Chhattisgarh, the median reverses who is leading by putting the BJP ahead, but it still shows a hung assembly, which means Ajit Jogi and his motley alliance are the kingmakers. But Chhattisgarh does have one outlier, India Today Axis, that is predicting a huge Congress victory. 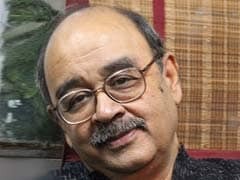 Conventional wisdom does not support such a victory; instead, it believes that the Congress lost this winnable state by not tying up with the BSP and Jogi. Last time around, the Congress trailed the BJP by less than 1%, and given how well they seem to have done in other BJP-held states, this should have been a cakewalk. Madhya Pradesh is more intriguing and being the biggest of the states, the most interesting. Kamal Nath's Congress army has stormed this BJP bastion, but has it done enough to topple Chief Minister Shivraj Singh Chouhan, who only yesterday called himself the biggest pollster and promised a huge BJP victory? Well, a couple of polls support him, and give the BJP 120+ seats in the 230-seat house. 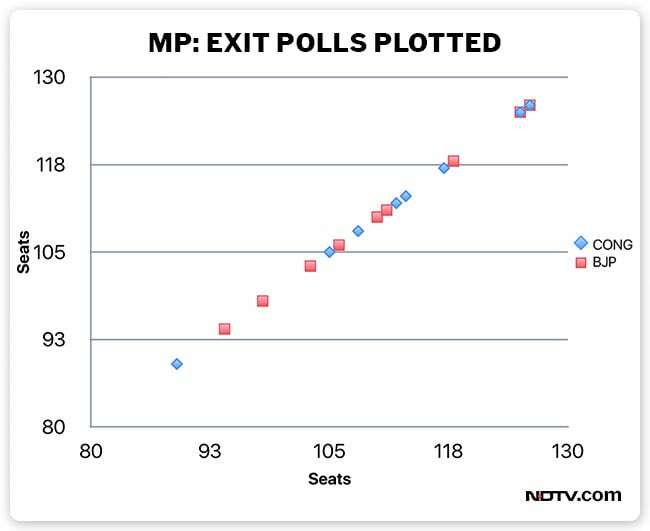 A couple of pollsters also give that to the Congress, but the graph below has most exit polls showing a hung house. But the median graph gives the Congress a slight edge, tantalizingly close to a majority, but not quite there. And if they reach 112, the BSP will probably be shamed into supporting them. The problem for the Congress remains that the BJP starts with a solid 72 seats, while they, with only 58 seats, need to pick up almost that exact number to win. A 4-5% swing would see them home, but that swing has to be across the state and not just in traditional Congress areas like Chambal and Mahakaushal. They must crack Malwa to win and CSDS in their survey, which gave regional break ups, showed the Congress has breached the walls of Malwa with them trailing the BJP by a mere 1%, and trailing the BJP 33 to 29 in an area where they hardly held a seat last time. If that holds true, the great predictor could have made his last prediction. What Malwa was to Madhya Pradesh, Mewar was to the BJP. And it is here, that the Congress is said to have made inroads. Now, Rajasthan could be said to be the pollsters' dream. Everyone was predicting a Congress victory long before the election began, so the question was by how much would the Congress win? Early predictions were for the Congress getting over 130 of 200 seats; even the satta market went with that. Over the past few weeks, those Congress hopes have been trimmed somewhat, and so while everyone but one (Republic-Jan ki Baat) has the Congress winning, most have cut their forecast to just a small majority of 10 or so. There is even talk of a repeat of 2008 where Congress with 96 seats cobbled together a government. 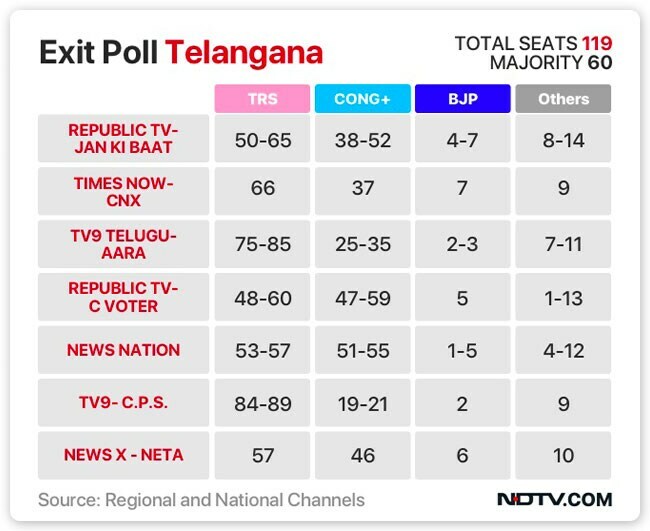 And while the average versus median does not show much difference here, it is worth remembering that as in the case of Telangana, there is very little time between the exit polls (which were broadcast just after voting ended in Rajasthan and Telangana). So it's a bit raw. That, with the fact that the Congress needs huge swing of 8% to win, has kept BJP hopes alive. In Mizoram, the Congress has lost ground and is likely to have to compete with the Mizo National Front for "others" to form a Government. And this could be well be the story of this election: the Congress failing to win the states it should. From failing to capitalize enough on the anti-incumbency factor and/or making bad or no alliances, it has missed the chance to win 5-0. Instead, like in Karnataka, it may just limp home and take pleasure from stopping the BJP rather than emerging as the power in Central India.